Joshua Lewin joined Isaacs and Company in 2004 after working with high-profile and progressive fashion/lifestyle brands at BlackBook magazine. Joshua now services the real estate needs of such brands by pairing their sales, marketing and branding objectives with opportune locations in today’s dynamic real estate market. His insider’s grasp of current retail trends, proven negotiation experience and commitment to customer service has enabled Joshua to complete transactions on behalf of clients including: Acne Studios, Alexander Wang, Proenza Schouler, Altuzarra, Herno, Stone Island, Fjällräven, Aether, 3×1, Band of Outsiders, Mulberry, Costume National, Vans, Wolverine/Sperry, AG Adriano Goldschmied, M5 Showroom, Want Agency and Want Les Essentiels da la Vie. 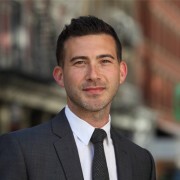 Joshua has also successfully worked on several prominent Landlord assignments on Madison Avenue, in SoHo, and other fashion-oriented locations. Originally from the Washington D.C area, Joshua graduated from the University of Wisconsin-Madison with a B.A. in Communication Science. He resides in New York with his wife Laurie, his son Chase and daughters Dylan and Taylor.